Amélie is a 2001 romantic comedy film directed by Jean-Pierre Jeunet and starring Audrey Tautou. 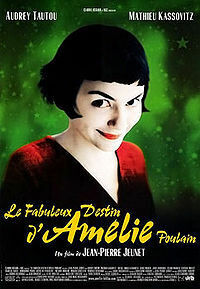 Its original French title is Le Fabuleux Destin d'Amélie Poulain ("The Fabulous Destiny of Amélie Poulain"). Written by Jeunet with Guillaume Laurant, the film is a whimsical and idealized depiction of contemporary Parisian life, set in Montmartre. It tells the story of a shy waitress who decides to change the lives of those around her for the better, while struggling with her own isolation. The film was an international co-production between companies in France and Germany.